I’ve got a co.uk domain I want to host with DH, although it is registered elsewhere. If I go log in to my registrar to change the DNS details, I’m faced with a few fields I’m not sure what to do with - it’s not as simple as inserting ns1.dreamhost.com etc etc. Can someone clarify this for me? What details to I insert in the top section? Do I need a cname record? What are the MX details I need in the bottom section? you need to change the name servers themselves. the A records relate to where it ends up. e.g., set an A record for subdomain.yourdomain.com to point to your home server will forward calls to that subdomain to your home server… MX is your email records. Thanks. I reasonably familiar with the basics - I’m after the specifics. What are the Dreamhost MX details I need to insert? Regarding the A records, I’m simply not sure which of the DH DNS details I need to insert in which particularly field at my registrar. Apologies if I’m asking something that’s screamingly obvious to anyone else. Well, thats the thing. You need to update the name server records, not the a or mx records. 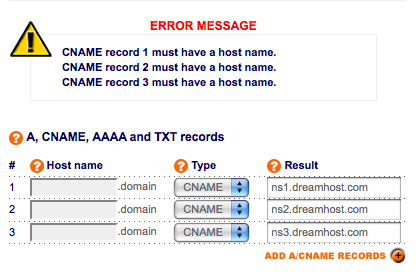 Once you change the name server records, you’ll control dns through the dreamhost panel. Perfect. That’s exactly what I need to know. What do I need to insert in the ‘host’ fields? You’re still in the “wrong section”. Right now, your “host” is both the registrar and the domain server for your domain. The panels you’ve been posting control the DNS records for the domain server for your domain. If you can, what you need to do is to set the actual domain servers controlling the DNS for your domain. 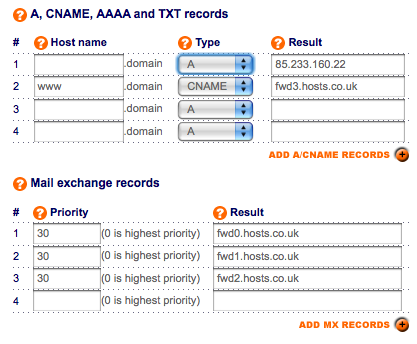 In many web panels, that is over in the “domain registration” section, not the “DNS” section. and it has a few of the same name servers yours does. You need to set the nameservers through whatever “Advanced” method they have. Otherwise, if you cant find a button to let you do that, you may want to email them and have them change it for you. I know with GoDaddy, its a simple process for me to change my name servers around. Some hosts make it so difficult that its just plain annoying. They say they make it “easy,” but in fact they make it harder since you need to jump through hoops to accomplish something as simple as nameservers. Thanks Lensman, now switched - I was wondering why this so much more difficult that any changes I’d made before. Much appreciated.